The beautiful Pemaquid Point Light is open to the general public for climbing thanks to the American Lighthouse Foundation and its dedicated chapter, the Friends of Pemaquid Point Lighthouse. Visitors to the historic tower not only are provided the opportunity to retrace the steps of bygone keepers, they are also treated to a breathtaking view of the surrounding seascape atop the beacon. The magnificent Pemaquid Point Lighthouse experience doesn’t stop there though. Status: Active aid to navigation owned by the U.S. Coast Guard and licensed to the American Lighthouse Foundation. 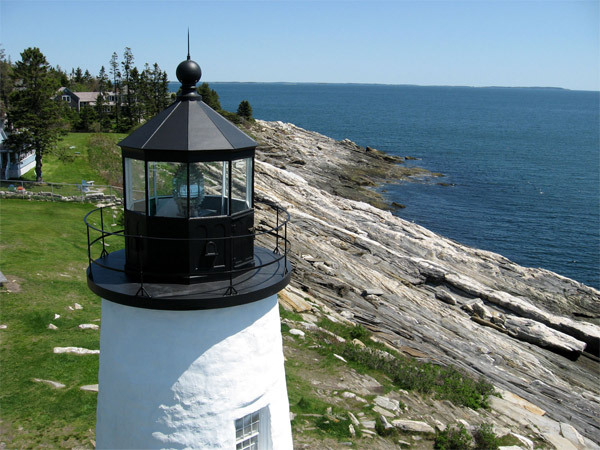 The Friends of Pemaquid Point Lighthouse – a chapter of the American Lighthouse Foundation, is dedicated to restoring the historic lighthouse. The first lighthouse at Pemaquid Point was constructed in 1827. Eight years later, the poor construction of the original tower necessitated that a new tower be built at the station, which was completed in 1835. 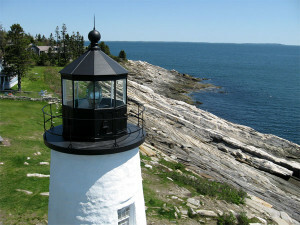 Pemaquid Point Light received its first Fresnel lens – a fourth order, in 1856. The U.S. Lighthouse Service constructed a fog bell house and tower in 1897, but by 1930 the bell was removed from the light station. The lighthouse has the distinction of being the first sentinel in Maine to be automated when its keeper was permanently removed in 1934. Note: All weddings and large gatherings must be scheduled through the Town of Bristol. The fee for a wedding is determined by the number of invited guests, each of whom will be provided free entry by means of a personalized pass. The Town of Bristol has adopted this policy in order to avoid overcrowding, parking problems and the over-taxing of on-site sanitary facilities.